Living organisms and nonliving matter form an ecosystem by working together. Lake ecosystems include sediment, H2O, microscopic organisms, fish, birds and plants. As a general unofficial rule, lakes are deeper and larger than pools of water considered ponds. Dozens of freshwater plants inhabit the recesses — along the edge and under the surface — of lakes. The American white water lily flower opens for only part of the day. The water lily, Nymphaea odorata, grows in water 6-7 feet high. It easily takes over shallow water along the edges of a lake and can cover acres of water. Distinguished by white or pink flowers and large, oval leaves, nymphaea odorata inhabits most of North America. Typha, commonly called cattails, grow up to 9 feet tall in large groupings along edges of freshwater lakes, ponds, marshes and wetlands. Cattails get their name from the thick brown protrusion at the top of the plant, which resembles the end of a cat's tail. In the fall, the long brown protrusion bursts, leaving a cotton-like cluster of seeds, which spread by wind and animal contact. The muskrat, Canada goose and stagnant pond snail eat the plant. Dozens of other animals use it for protection from predators and the elements. 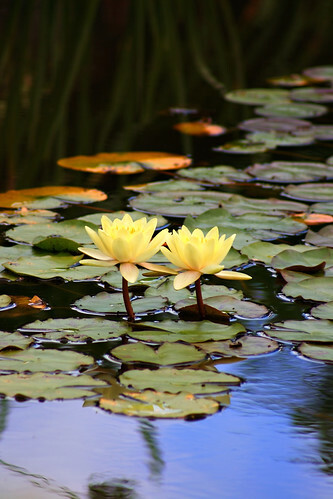 Often confused with the water lily, the yellow pond-lily sprouts yellow flowers with a thick center and rose-like petals. 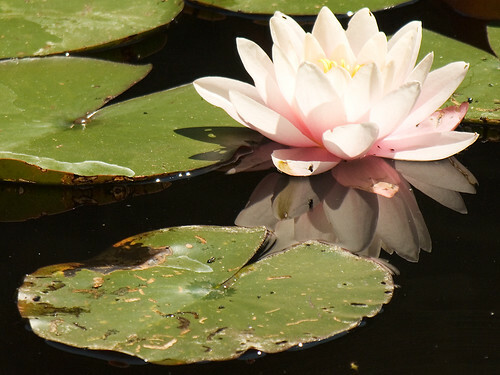 Native to Asia, North America and Europe, the yellow pond-lily grows in 1-3 feet of water and can, in the right conditions, continue to grow above the water surface. Heart-shaped leaves have a 12-inch width. Named for Queen Victoria, the Victoria water lily has several subspecies which can easily be determined by the width of the outer rim. 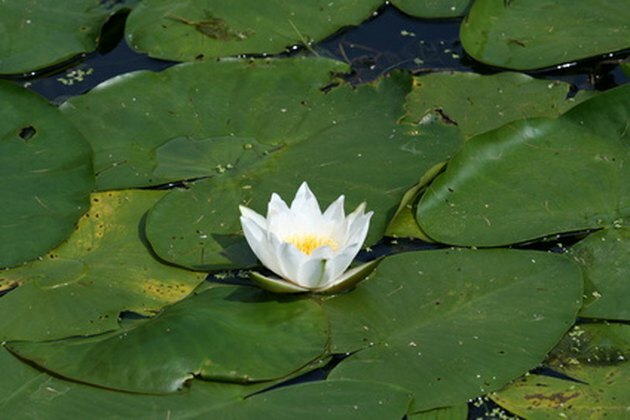 The Victorian water lily can grow leaves up to 6 feet wide with an additional 2- to 6-inch upturned rim. The white flower — each plant has 10 or 12 — develops in summer with up to 50 petals and an 18-inch diameter. It blooms only two days. The Victoria water lily originated in South America around the Amazon. Brasenia schreberi, commonly called watershield, has oval 4 ½-inch leaves which sprout above the surface of the lake. Spread throughout North America, watershield has tiny red flowers. Some arrowleaf species grow along the edges of freshwater lakes. Among them are Arrow falsepickerelweed. The weedy plant has arrow-shaped leafs and small purple flowers. Lizard's tail grows along the edge of lakes in dense colonies. Lizard's tail has a long, curved flower stalk with tiny flowers, which gave the plant its common name. Heart-shaped leaves grow about 5 inches long. It provides food for the common snapping turtle, eastern painted turtle, honey bee, golden northern bumble bee, stagnant pond snail and crane fly. Native to Eurasia, the weedy water chestnut has stems up to 16 feet long and quickly crowd out native species. The plant limits human activities on the lake and does not provide a food source for wildlife. Several species of floating heart thrive throughout the United States. Yellow floating heart has small, heart-shaped leaves and a pansy-shaped yellow flower. Native to Asia, this invasive species is generally larger than native floating heart species. Native to Southern Africa, cape-pondweed acts like the water lily, growing 4 feet tall and floating on the water's surface. It has oblong leaves and delicate white flowers. The flowers look like two ferns with the stems attached at the base. Amy L. Gouger holds a Bachelor of Arts in English from East Stroudsburg University. Previously a technical agent, she now serves as a ghostwriter and contributor to various online publications.